It may be said that the Duke and Duchess left Vancouver feeling very much pleased with this magic city and its people. When they return on Thursday morning on their way to New Westminster, they will find the populace still as loyal, and they will, one may be sure, be only too anxious to show how they have been touched by the expressions of good will and love they saw and heard here. There was one touch of nature which made them kin to everyone in Vancouver. In the private dressing room at the Drill Hall of Her Royal Highness, every need in the way of toilet accessories was daintily filled with such taste as did more than credit to those in whose charge the apartment was, but there was one additional feature. On the dressing table were placed four little silver heart-shaped frames, enclosing each a pretty portrait of one of the four little children of the Royal House of Cornwall and York . It is said that the Duchess did not speak for a moment, and then went straight to the room of the Duke and carried him away with her to see this little glimpse of the home life which they have left behind and which, amid all the public plaudits of the great colonial empire, they so sorely miss . That little bit of sympathy and thought for a mother's heart will keep Vancouver green in the memory of May, Duchess of Cornwall and York, when the shouts of peoples, the blaze of color and light, given in her honor, are dimmed with the passing years. After the royal party had gone on board the steamer and removed the effects of their drive, His Worship Mayor Townley  was specially summoned to their salon and was there presented with autograph photographs of the royal pair. They also enjoined on him to express their heartfelt appreciation of the splendid reception that had been accorded them. They confessed that, while they had heard much of the city of Vancouver since coming to Canada, their realizations far, far exceeded their most sanguine expectations. It was hard for them to believe that Vancouver was not yet out of her teens . 1. 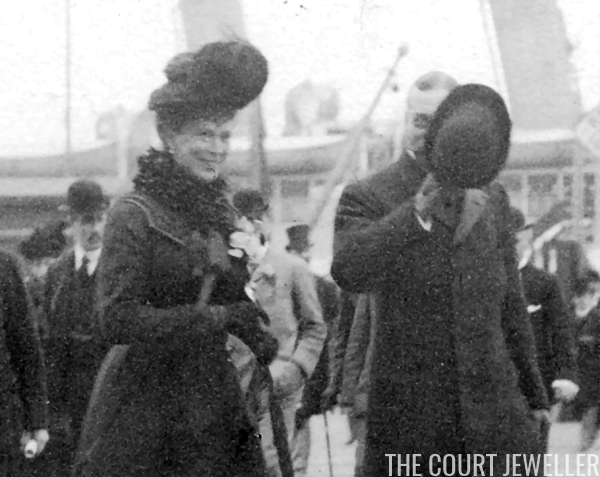 King George V (1865-1936) and Queen Mary (1867-1953) of the United Kingdom. Queen Victoria bestowed the York dukedom on George in 1892; when she died in January 1901, and he became heir apparent, he automatically inherited the Cornwall dukedom as well. 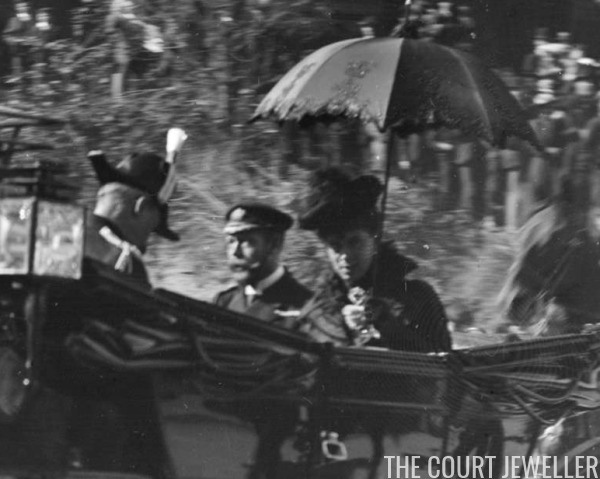 George and Mary were Duke and Duchess of Cornwall and York for almost a year, until he was created Prince of Wales in November 1901, shortly after the end of this imperial tour. 2. 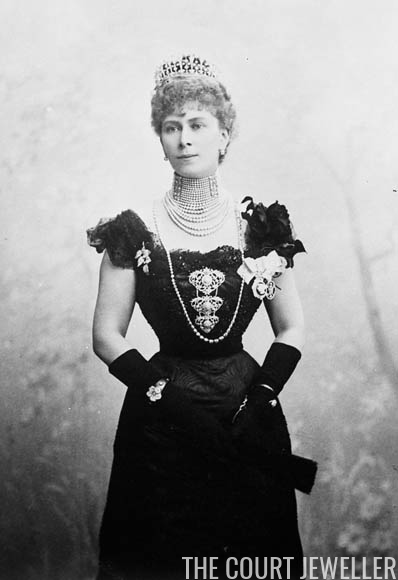 The Empress of India was the Canadian Pacific ship that carried George and Mary during their visit to British Columbia, sailing between Vancouver and Victoria. 3. The "earlier George" is George Vancouver (1757-1798), the Royal Navy officer who led an expedition to the northwestern Pacific coast of North America aboard the HMS Discovery in the late eighteenth century. Vancouver is, of course, named for him (as are various other places in the region). 5. In October 1901, George and Mary had four children: Prince Edward (later King Edward VIII and then Duke of Windsor), Princess Mary (later the Princess Royal and Countess of Harewood), Prince Albert (later King George VI), and Prince Henry (later the Duke of Gloucester). Their fifth child, Prince George (later the Duke of Kent) was born in December 1902; their sixth child, Prince John, was born in July 1905. 6. The imperial tour that George and Mary embarked on after Queen Victoria's death lasted for months, taking them to colonial holdings all around the globe, including Australia, New Zealand, South Africa, and Canada. They left behind very small children (Prince Henry was only a year old) at home. George and Mary have often been criticized for their royal parenting, but little moments like this show a bit of emotion behind the cool facade of duty. 7. Thomas Owen Townley (1862-1935) was the eighth mayor of Vancouver. He served only one year-long term. 8. Vancouver was officially incorporated in April 1886, so the city was indeed a teenager -- only fifteen! -- at the time of this royal visit.